The Malmquist Construction Team brings joy to the dream of a custom Montana home…. and there has never been a better time than now to begin. in process or budget, either. Custom-built can mean simply built to individual specifications. If we like affordable and enjoyable, well then, that can be what custom means to us. Certainly, we all have a dream of home that is tethered more to our hearts than to a dollar sign. Enjoyable can be part of our dream. Malmquist Construction wants you to remember your dream. Get right inside of it in the present moment, believe, and make it happen. It’s your dream and you can enjoy it! Especially with the devoted support of a skillful team, the process can be enjoyable in many dimensions. And it is generally far more fun to get busy with both hands building a dream than to stand around wringing one’s hands in doubt. So how to put aside doubt and jump in? What usually helps with this? Trust. Trust does seem to make many things possible. Malmquist Construction’s years of experience and long- standing relationships with firms, subcontractors, and customers speak for themselves. Casey Malmquist and company focus on team, not trophy. Transparent communication and shared knowledge facilitate any creative relationship. It also seems that the more one knows about something, the more relaxed one is. When we are relaxed, we tend to have more fun. To this end, Malmquist Construction approaches each custom home building project with wide-open communication about the project’s budget and progress, and includes the customer as part of the team from the start. With engaged and trusting homeowners who participate collaboratively in creating their dream, everyone learns and has fun together. Choices at each step of the home-building process create a balance between the customer’s lifestyle, skills, and preferences with the expertise and creative process of the building team. Inspired and empowered by the homeowner’s vision, discussions begin with design and site planning. At every step that follows, the customer can make choices about the nature of their participation in the project. Some find that their skills in design or planning are best suited to the early stages, while others find that their experience lends itself to participation in the construction, interior finishing or landscape stages. Homeowners enjoy being able to trust the Malmquist team to adeptly handle any aspect of a custom home project from start to finish, as well as to participate actively at varying levels along the way. Casey Malmquist and company focus on team, not trophy. The integrity of the Malmquist team shows in the pride in workmanship on the job site and it imbues every unique home. A fine finished product comes about through commitment and attention to detail, along with creative adaptability. Change happens, and when it does, solid communication and trust allow the team to stay flexible and fluid. The Malmquist team enjoys the process of learning with each new project, and prides itself on working with those who bring can-do attitudes to the table. It is a testament to their professional dedication that projects often seem to come together effortlessly. Through forward vision, committed and applied expertise, creative teamwork, and well- tuned orchestration, a definitively custom home comes to be from the origins of a dream. Who knows, in the end you may find that building a dream home was not only about the trophy accomplishment after all. You might find great value and satisfaction in the incredible ecology of complex moving parts—resources, materials, people, and ideas—and the friends and community made along the way. Perhaps you are one of the folks out there ready to create a new custom home. 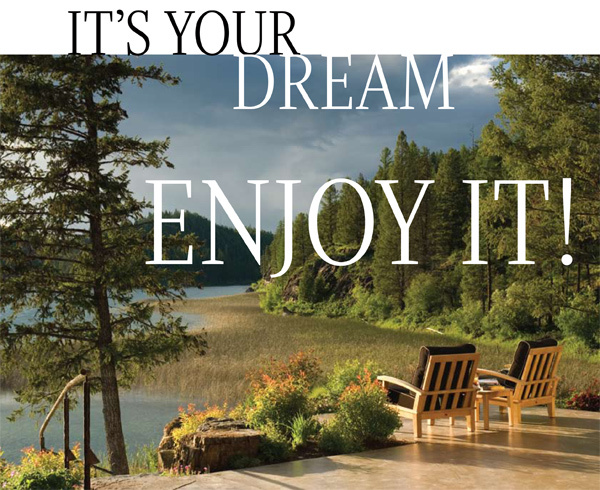 A dedicated team is ready to help you make that happen at Malmquist Construction in Whitefish. There has never been a better time than now to begin.